In this article, we would like to explain important reasons why we recommend WordPress as blogging and Content Management System (CMS). We have used WordPress for Blogging, e-Commerce, Forum and much more for several years. Basically, we impressed with how WP work and write this post to share our experience. So, why choose WordPress? Creating Post and Page are very easy. Just select ‘Post’ or ‘Page’ in left Navigation Bar and choose ‘Add New’. Add title, write some paragraphs, Choose suitable Category/Tags and click ‘Publish’. Simple isn’t it? It is easy to navigate. All features are accessible by selecting menu on left sidebar. Easy to manage. We could change all setting in admin Dashboard. All we need is choose suitable setting and click ‘Save Changes’. WP designed with simplicity as main concern. Easy to Update. WP could be updated easily by clicking ‘Update Now’ button in admin Dashboard whenever new update available. There is even automatic update which make it easily to update our blog without user interaction. Easy to Install and update plugins. It could be installed easily just by navigate to ‘Plugins’, click ‘Add New’ then search for available plugins and click ‘Install now’ button. Updating it is even easier. Just click update now from Plugins page and one or all plugins could be updated automatically. Easy to install and remove any themes. You could install any theme easily from ‘Appearance’ menu. You could select any free and popular themes from online repository or upload your own design. You may choose ‘Customize’ menu to change how your blog visible to visitor. Updating it is easier as you only need to click update button. You can save as much themes as possible in your WordPress installation. If you want to remove any of your themes, just click ‘Theme Details’ and ‘Delete’. Pretty Permalink. This is first feature which we really need. WP could transform ugly links into easy-to-remember links. A must have feature. Theme Preview. A handy feature to view any themes before using it as primary theme. Spam protection. WordPress has handy built-in plugin to prevent spam. WordPress is SEO-Friendly. It has internal system which make your blog get better ranking than others. WP is effective CMS which make it easy for any crawlers to better index and categorize your site. There are much more features you would find it useful. Just try it by yourself and you will enjoy using WordPress. 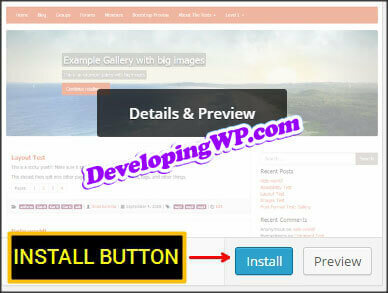 WP utilize plugins to extend its functionality. Plugins could dramatically improve performance of your site if used correctly. It also able to transform WP into another platform such as for Online Shop (e-Commerce), Forum (Discussion Board), Listing Sites (Article and Web Director) and much more. There are lots of plugins which developed by notable authors. WP is supported by huge selection of plugins which can be used free of cost. There are so many themes which is designed especially for any purposes such as for Gaming Site, Personal Blogging, Business Page, Portfolio and much more. All of them available for free and could be customized as your wishes. WP uses less resources to fulfill the task. It only need small amount of memory and CPU usage if configured correctly. There is good reason why choose WP than other CMS. WP could handle million of posts without much noticeable slow down because it uses less query than others and able to cache the output. By using WordPress, the resources on the server would be used efficiently. In other words, WP is efficient and flexible. WordPress is available for everyone as free blogging and CMS platform. We can use it for any good purposes without need to pay it. Developing WordPress require much times and efforts. We should thanks developers for creating this awesome CMS.